Upper Deck made waves in the trading card industry last week, releasing a new digital trading card platform called e-Pack. Unlike other digital trading cards, e-Pack cards have physical counterparts. Well, the hits and inserts do anyway, while the base cards exist only in digital form. However, base cards can be upgraded for foil parallels, and these foil parallels, along with the hits, can be shipped to the collector, making e-Pack the first of its kind in the trading card world. Chris Carlin, senior marketing and social media manager of Upper Deck, had a discussion with me about the new e-Pack platform, why collectors should be excited, while retailers shouldn’t be worried, and how e-Pack will succeed where others have not. 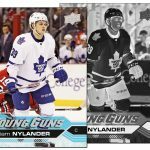 Sal Barry: What could you tell us about the new e-Pack hockey cards? Chris Carlin: Upper Deck has been working hard to really grow the hobby, in particular over the last two years. 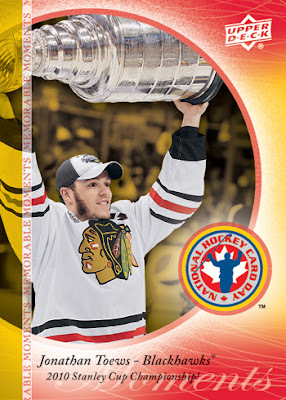 We’ve done a lot with regard to having growth with programs like National Hockey Card Day. This year, we created collector guides, as we knew there would be a lot of new and lapsed collectors coming back to the hobby. 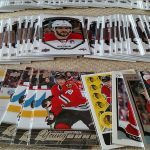 So there has been a tremendous amount that we’ve done to expose fans to trading cards, to educate them. Now, the natural progression is to bring it to a more convenient platform. 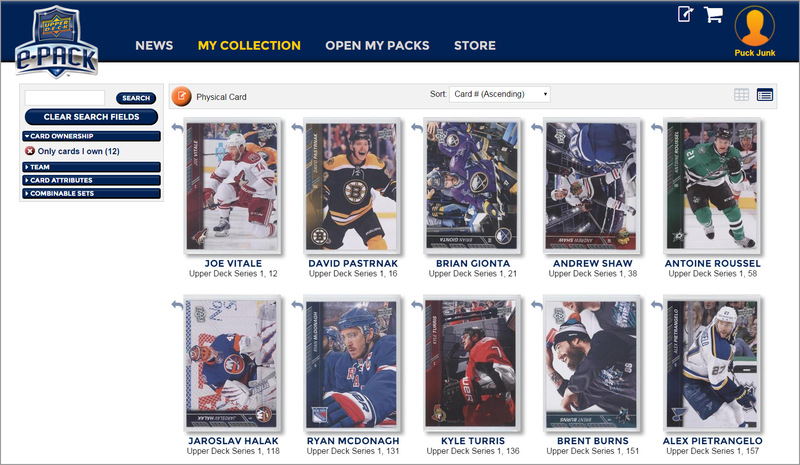 With e-Pack, customers can open up trading card packs anytime, anywhere from their tablet, their phone, from their computer. And it’s just a really exciting way for people to engage in the hobby who don’t have a hobby shop near them. You can get a free pack of digital cards each day when you log in. SB: How long was e-Pack in development for? CC: A little over two years. Collectors can buy a packs, full boxes or even a case from e-Pack. They don’t have to open them right away, either. SB: Right now, Upper Deck Series One is out in e-Pack form, and Series Two will be available. Are there any other sets that are planned for e-Pack releases? CC: We have one other set scheduled for this season. Again, it’s important for us to make sure that we are not stepping on the toes of our hobby shop partners. We want them to have exclusivity with the vast majority of the releases that we come out with every year. At the same time, it’s important for us to allow fans the opportunity to open products who don’t normally get to open products. SB: Will there ever be any e-Pack sets that you can only buy through e-Pack? CC: Never say never, but that’s not our intention with this program. SB: Upper Deck has worked hard to protect the hobby shops, but it seems like e-Pack cuts retailers out of the picture. How can these two things coexist? CC: When any new technology comes along, it’s scary for our hobby and retail partners. I remember when eBay first came out. Every shop I talked to said “this is the end of the hobby; we’re all done for.” Now, eBay is out there, and you learn how to exist with it, you learn what to do with it, and now most shops have their own eBay accounts now and it’s a whole different realm. I understand those concerns, but again, if everyone just takes a look back at what our purpose is here with this, to create more collectors. And with more collectors, a rising tide lifts all ships. With more collectors and more fans out there, there will be more customers for hobby shops down the line. Pricing-wise, I know there were some concerns with what these products are priced at; they seem lower than hobby shops. But there are additional fees involved in getting the cards delivered to you that make the price of e-Pack product a little more pricey than hobby shops. So, our goal is to never undercut or hurt our hobby partners; our goal is to grow the hobby and create more collectors. SB: Will e-Packs have hobby or retail odds? CC: They are hobby product. SB: Will e-Pack cards ever sell out, or will they be made as long as people are clicking on that button to buy more? CC: They will absolutely sell out. These cards were produced with the hobby and retail versions of Upper Deck Series One. They are much more scarce than the hobby and retail versions of Upper Deck Series One. So yes, we absolutely anticipate that each release will sell out. What’s interesting, however, is that people don’t need to open their packs. They can keep a sealed box of e-Pack online. They can keep a sealed case, and potentially have a vintage product in a digital format. So there’s a lot of things that are going to come about with this program in the future that we are just scratching the surface on today. SB: So if somebody buys a case, there’s an actual physical case somewhere that they paid for? CC: There are the actual cards. Once you make that transaction, there’s an algorithm that determines the insert ratios, the cards that will randomly be picked to go in with this case purchase. And those cards are then allocated to that customer. However, if they choose not to open it, those cards are still allocated to them. They are still in a protected state. But they are not in physical packs or boxes, per se. There are a couple of benefits to this. One, it allows us to operate a little more green. Foil packs aren’t really recyclable. So, there’s some nice benefits to that, in terms of operating in a more green fashion. But also, there are issues with the mechanized process of putting trading cards into a pack. So, this eliminates a lot of issues that our Quality Assurance department sees with regard to damage in trading cards. Potentially, there can be mechanized problems that can occur with collation, or insert ratio, because again, they are machines. Having a computer system in line, we can make sure the insert ratios are very clean, and break very well for collectors. While hits, parallels and other chase cards have physical counterparts, base cards exist only in digital format. 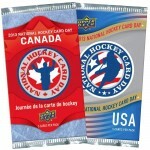 SB: How does e-Pack fit in with other Upper Deck hockey products? Will it replace them? 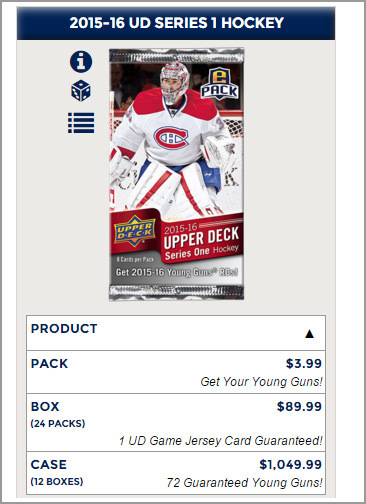 CC: Think of a product like Upper Deck Series One; you have a hobby version, a retail version and a digital version. It’s a new stream commerce for us, again really designed to reach that collector that doesn’t have a hobby shop nearby. Or they have a hobby shop nearby, but it isn’t open when they have time to go visit. It’s designed to be convenient. It is important to remember that whether e-Pack debuted this year or not, we were always going to produce the same amount of hobby product for 2015-16 NHL Upper Deck Series One. Nobody was shorted in their physical packs, boxes or cases because of e-Pack. 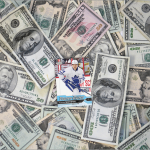 The allocation of product used in e-Pack was just distributed differently to give those who don’t have a hobby shop nearby the opportunity to experience the product for the first time during a very special year for hockey cards. I don’t think these will ever replace physical trading cards. Physical trading cards are one of the reasons we came up with e-Pack. All of the other applications were basically selling air. 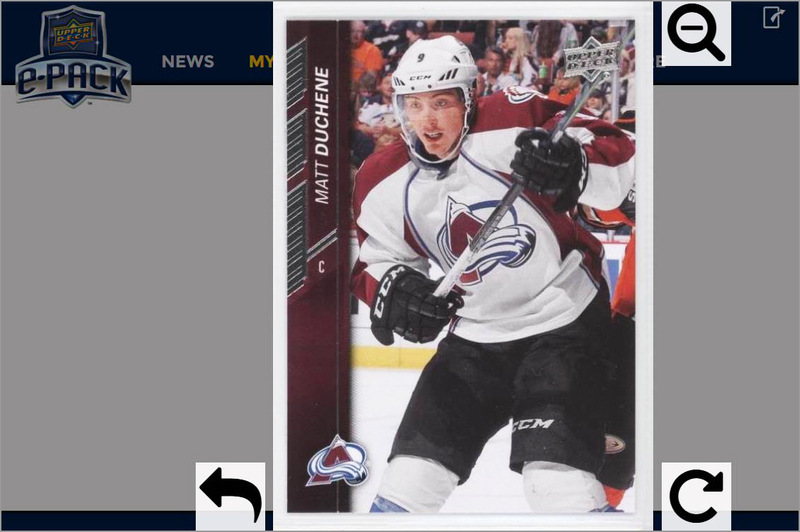 We felt that it was incredibly important to tie the digital experience to a physical trading card because there is no replacing pulling an autographed or game-used jersey card. Your hands shake, you get excited. So now, it’s either happening when you open a physical pack or when you open it on your phone. SB: So, collectors might get an autographed card, and then be able to get the physical copy of it? CC: Absolutely. And what’s really compelling is that each card is scanned. So, if you pull two autographs of Alexander Ovechkin, you’ll be able to tell that you have two different cards based on the slight differences in the signature. So, that was a pretty big undertaking for us, but it was important that we provide customers with the exact impression of the card that they will own. SB: Over a decade ago, Topps issued trading cards called eTopps, where you would go to their website and buy the physical cards, and then you could trade them online or get those shipped to you. But, over time, the idea failed. How will e-Pack succeed where eTopps has failed? CC: Well, the biggest problem with eTopps is that there was no pack-opening experience. That’s really the fun of the hobby, is opening a pack. You were just buying individual cards from the eTopps platform. There was no way, at that time, have all these cards scanned, show you the actual card you’d get and have an algorithm to do this from a smartphone. The technology just didn’t exist. I think we are at a point now where we saw there was a gap in the market, and that we could evolve the market and continue to be innovative while improving the overall experience for those who like to indulge in the hobby in this way. SB: Will people be able to trade cards with each other? CC: That is on one of the future installments of that platform. There will be an app version for iOS and Android as well. There’s a lot of cool functionality that’s coming with this that we’re really just scratching the surface with our initial release today. People can still trade via Check Out My Cards right now, but that will get enhanced as time goes by. Soon, collectors will be able to trade with each other through the e-Pack platform. SB: Can you tell us when the mobile apps are coming out? CC: All I can say is that they are coming soon. SB: Will the Android and iPhone e-Pack apps be released simultaneously, or have staggered release dates? CC: Our goal is to have them out at the same time. SB: Collectors were annoyed with Topps because their Star Wars Card Trader app came out for iPhone users in December 2014, but wasn’t released as an Android app until April 2015. By then, a lot of the better chase and insert cards were already owned by iOS users, and Android users couldn’t pull these cards from packs anymore; they had to trade for them because they came to the party six months later and were at a disadvantage. CC: We are aware of that, so that was one of our concerns as well. Anything can happen in the tech space. Our goal was to have the apps in time for this initial launch, but there’s a lot that goes into those. You want to make sure everything works and that it is a great experience. So, we wanted to take our time and make sure we did this right. SB: Why do a redemption program within e-Pack? CC: There’s a lot of times that people open up cases, take all the chase cards and leave all the base cards for kids to have, or however the shop wants to get rid of them. So, we wanted to come up with a way to help those customers get a compelling and interesting card for all those duplicates they have. So, they can combine multiple cards to receive a parallel card that is much more rare, and is an e-Pack exclusive. I think that is really unique. There will be more coming out about that as people dabble with it and play with it more, but the parallel versions of some of these cards are pretty cool-looking. The application will let you know when you have enough copies of one card to combine them to exchange for a foil parallel. I think a lot of people will be inclined to try that, because a lot of times you are stuck with a lot of duplicates. This provides a compelling alternative to having to trade those out. Great interview Sal, was really interesting to hear more about where Upper Deck plans to go with this. Interesting but ultimately I am, not interested in an e-pack. I like the physical opening experience, having the cards in my binders, etc. If I wanted an electronic version I would fire up NHL 2015 on my Xbox. Just not something I am going to get behind. Thanks for reading, guys. Glad this could answer some of your questions.